GENEVA, Switzerland – The first round of the Swiss federal elections ended with less than surprising results: the country continues to tilt right with the anti-immigrant and anti-EU Swiss People’s Party (UDC in French/SVP in German) taking 11 new seats in the National Council while the Radical Liberal Party (PLR in French) gained three more spots in the Assembly. Geneva contributed one spot to the PLR gains. However, not surprisingly, the Geneva Socialist Party (PS in French) managed to keep intact its representation in the lower house. The Swiss gather every four years to elect their representatives to the bicameral legislature known as the Federal Assembly or Swiss Parliament (some English-speakers would also call this Congress). Voters choose 46 representatives to the Council of States or the Assembly’s upper house/Senate. Their job is to represent the interest of each of the cantons in Bern. Each of the 20 cantons selects two Councilors while each of the six “half-cantons” sends one. Councilors must obtain an absolute majority to be elected, if not, a second electoral round takes place three weeks later. Canton Geneva gets to send 11 representatives to Bern. For the larger part of three decades, these have been mostly members of the Socialist Party, the PLR , PDR and most recently, the Greens and UDC/SVP. What does the new National Council look like? the Left to the Left made its way back to Parliament earning one seat. The MCG, a far-right political group from Geneva whose main platform is to blame frontaliers (French-residents that work in Geneva) for the high unemployment and insecurity in the canton kept its seat in the Council. While the Socialists lost three seats, they still have the second largest contingent in the Swiss lower house with 43 Councilors. With this new distribution, the socialists will no doubt have to make significant compromises to their political strategy in Bern. In Geneva only 43.59% of registered voters participated in these important elections. In total, 26 political parties participated, only six got a candidate elected. Of those elected, only three were women. Les Verts couldn’t hold on to their two previous seats. Lisa Mazzone, President of the party was reelected but the second spot was lost to the PLR which upped its Geneva participation in the Swiss Parliament by an extra seat. The PLR Genève will now send three, instead of two Councilors to Bern. Christian Lüscher and Hugues Hiltpold (photo here below), both strong supporters of Swiss banking secrecy, and Luscher a firm believer of building nuclear plants in Switzerland, were reelected. Benoît Genecand is now the third PLR Councilor. The Social-Democrats kept their three spots. Those reelected include Carlo Sommaruga and Manuel Tornare. The latter is a former Geneva mayor who has made protecting the International Geneva part of his political platform. Réélu. Le PSGenève maintient ses 3 sièges. Merci à celles et ceux qui m'ont soutenu. Laurence Fehlmann Rielle is the third – and newly – socialist elected to the National Council. Fehlmann considers herself a feminist and says she will continue to advance women’s agenda in Bern. Guillaume Barazzone, a PDC Geneva City Councilor, was also reelected. He also managed to increase the number of voters for his party in the canton. Two UDC Councilors were reelected Céline Amaudruz whose political platform includes keeping Switzerland away from EU agreements, and Yves Nidegger, an open critique of “massive immigration” and vociferous proponent of the minaret ban a few years back. Last but not least, Roger Golay, former UDC Councilor who’s now jumped wagons to join the MCG, was reelected. Golay is a polarizing figure in Bern and is well known in the Council for wanting to increase the maximum driving speed to 130km/hr in Switzerland. The Green-Socialist duo of incumbents, Liliane Maury Pasquier and Robert Cramer ended at the top of the list in Geneva but neither one secured a spot to be elected on this first round. A second round on 8 November will include Benoit Genecand of the PLR and Raymond Loretan of the UDC who finished third and fourth. In other words, it will be the left vs the right fighting for the two Senate seats. 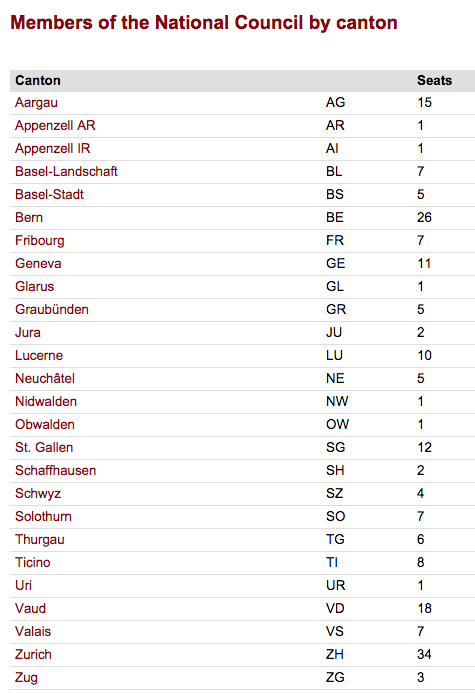 Geneva, Vaud, Valais and Fribourg will have a second election. Neuchatel reelected Didier Berberat (PS) and Raphaël Comte (PLR). Jura elected Anne Seydoux (PDC) and Claude Hêche (PS).